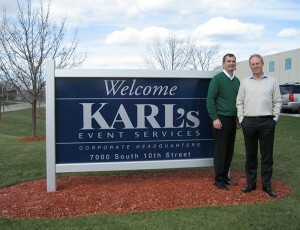 Event overlay specialist Arena Group has acquired US-based Karl’s Event Services. The acquisition of the $40 million revenue company extends the Group’s global network beyond its existing bases in the UK, mainland Europe, UAE and Far East territories. The transaction has been supported by MML Capital Partners and Sports Investment Partners (SIP), following on from these institutional shareholders original investment in the Arena Group in 2012 ahead of its various London 2012 Olympic contracts. These included one of the world’s most complex temporary sports stadiums; the 15,000 capacity beach volleyball stadium on Horse Guards Parade and eight other Olympic venues. Karl’s was founded in the U.S.A in 1966 and supplies temporary demountable structures, staging, lighting and furniture to clients including the NFL Super Bowl, Mercedes Benz New York Fashion Week and PGA and NASCAR events. Karl’s, headquartered in Milwaukee, Wisconsin, and has operational bases in New Jersey, Orlando and Ft Irwin, California. Greg Lawless, Arena Group CEO, states: "This acquisition enables the Arena Group to broaden its ability to deliver truly international event overlay and temporary infrastructure. The benefits of this increasing global network will be enjoyed by clients of all sizes as the sharing of knowledge, experience, technology and working practices continues to improve our offering. "On an international level we can now offer consistency of products and services for global sports companies and corporate events along with their commercial partners, whilst it also becomes viable to introduce creative and technical innovations to local events in any region we have a base. "Karl’s and Arena Group share a common ambition to deliver world class event environments working in partnership with our clients, and we immediately identified that same ethos in John Haener, CEO and president of Karl’s and his team. I am confident this will be a very positive transaction for all of our clients and employees worldwide."